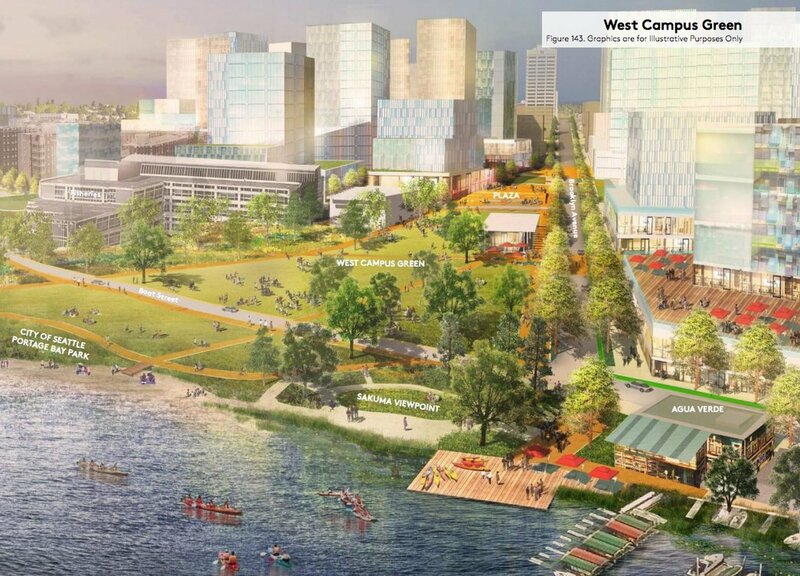 The Seattle City Council has given preliminary approval to a transformative expansion plan for the University of Washington (UW) that would create a new high-rise innovation district beside the UW’s waterfront campus in northeastern Seattle. The Seattle Times reported that the expansion could include up to 6 million square feet of new development, enough to cater to roughly 7,000 new students and staff members. Of that total, roughly 3 million square feet would be dedicated to the new innovation district, which is depicted in a rendering accompanying the proposal as a cluster of pixelated towers surrounding a proposed light rail transit stop slated to open adjacent to the campus in coming years. The expansion would also grow along the Portage Bay waterfront, according to a potential site plan, and would include up to 450 affordable housing units. Ultimately, the expansion could double the size of the university with respect to a previous growth plan approved in 2003 by building on top of existing parking lots and sports fields currently used by the university. The approval granted by the Seattle City Council is contingent on additional affordable housing—the university originally proposed building only 150 affordable units—and a greater emphasis on walkability and transit accessibility for the district than was originally proposed. According to the approved plan, the affordable housing component would serve to provide residences for some of the university’s new low-wage workers. The greater emphasis on transit access aims to ensure that those workers, many of whom are expected to drive in from far-flung and more affordable areas, have other options for getting to work. The expansion is aimed at increasing the size of the university without meaningfully expanding its footprint into surrounding areas. As a result, up to 86 sites currently owned by UW would be open to development, including several slated for high-rise development with a maximum height limit of up to 240 feet, The Times reports. Next, the plan heads back to the university for final approval. A project timeline estimates that the plan will come into being in phases over the next decade or so.